The Magic Mushrooms Slot is one of the offerings by impressive industry newcomers Yggdrasil. The game has a highly original format and offers a number of features throughout the game which will both keep you entertained and have you coming back for more. Here I’ll talk you through every aspect of the magic Mushrooms Slot. I start by detailing the basics of the game and explain what makes this game so original. Next I detail all of the features of the game and explain how you’ll win the biggest prizes. After giving a summary of the game, I recommend an online casino where you’ll be able to enjoy the range of Yggdrasil slots and many more from MicroGaming, NetEnt and more. The Yggdrasil range is not available at US-friendly casinos, US-based readers should check this guide for some awesome games which are licensed at offshore casinos. The first thing you’ll spot when playing this slot for the first time is that the game is actually in the shape of a diamond, with three symbols on show on the reels at either end, four symbols on show on the 2nd and 4th reels and five symbols on show on the middle reel. The other difference in the game that stands out is the fact that there are 20 pay lines on each side of the slot, meaning you’ll win if you land consecutive symbols from both left to right (which is standard) but also from right to left. This means that you’ll have a total of 40 pay lines, which is not customisable, however you’ll be able to choose the coin amount of your choice. 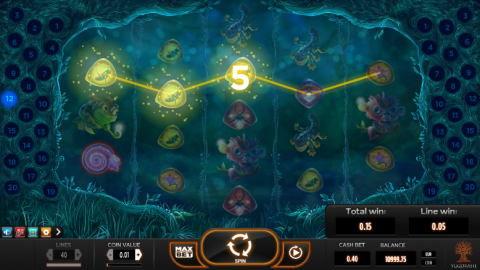 There is auto play feature which allows you to set the game to play a pre-determined amount of spins. The symbols in the game are all characters you might expect to find in a fantasy cartoon or film, some still encased in their own lava – they look fantastic on this sumptuous slot. Each symbol will pay if landing three consecutively from the left or the right. The top standard symbol in the game is what I can only describe as a ‘pink gremlin’ which pays 1,000 coins when landing five in a row. Interestingly the game has three separate ‘wild’ symbols, each one a different mushroom. The purple mushroom will only appear on reels 1 and 5 and acts as a standard wild. The blue mushroom will appear on reels 2 and 4 and will act as a multiplier wild, this multiplier being between 2x and 10x. The final wild is the red mushroom will appear on just the centre reel. This is a ‘spreading wild’ and can create up to 4 more wilds anywhere on the reels, with the possibility of another spreading wild meaning even more wild symbols. The game also has a scatter symbol, a glowing purple/red snail-like creature. If you land this symbol three times across any of the reels, you’ll gain 10 free spins. You’ll gain another 10 free spins if landing it four times with a whopping 75 free spins if landing it on all 5 reels. Many online slots follow a very familiar formula, where you’ll find a whole host of games that play pretty much the same way. This is most definitely not the case with this impressive slot. You’ll be struck how smooth the game is and graphically the game is excellent, this game being a million miles away from the original one-armed bandits. The features at the game are very good, especially the three different wilds which offers a unique take on that idea. Having win lines from both the left and the right is also original, although it will mean each spin will effectively cost double – if you do land 5 symbols in a row however, you’ll win the prize from both the left and the right, which makes it worthwhile! When playing a slot I generally look for a fun bonus game outside of the slot to add something a little different, however I don’t feel this slot needs it. Impressive indeed! As well as being able to enjoy Magic Mushrooms on a desktop or a laptop, there is a mobile version available as part of the iSense range offered by Yggdrassil. This range features cutting edge mobile technologies including HTML5 canvas elements and CSS3 transitions, with stop motion and particle animations. This is available on both Android and iOS platforms for both phones and tablets. You can enjoy the Magic Mushrooms slot at Mr. Green casino. This site is one of the most stylish online, and the stylish Magic Mushrooms slot makes for a perfect fit. When joining Mr. Green you’ll be able to take advantage of the up to £350 bonus scheme as well as 10 free spins at a selected slot (usually one of the latest NetEnt titles). See www.mrgreen.com for more.